Compared with the other villains in the Space Battleship Yamato saga, the Star Force’s first opponents weren’t necessarily the most powerful or even the best organized. But the Gamilas [Gamilons] endured all the way to the end and Dessler [Desslok] went on to become one of anime’s most popular characters of all time. Naturally, then, merchandising for the Gamilons outstrips that of all other Yamato villains. To prove it, here is a complete roundup. Save this for the next holiday season and give the gift of Gamilon to that special blue-skinned friend on your list. Starting with the smallest versions of the big guy himself, we have similar keychains from two different manufacturers. Banpresto’s 1999 version is on the left, and the other two are variants released by convenience store chain Sunkus in 2003. Their relative scales are unknown, but they are equally commanding. The next two are miniature figures from 7-11 (left) and Bandai (right), both wielding a steaming cup of Ecto-Gas, and both released in 2005. All of these miniature Desslers were part of larger sets that included other figures. The entire lineups can be seen in other product pages on this website. From the more vintage end of the market we find these two figures from Nomura Toys, released in October and November 1978. The first is a soft vinyl Dessler (a little under 4″) and the second is a slightly more articulated action figure (3.3″). Though they came out only a month apart from the same company, they obviously didn’t share the same reference material since the paint colors are entirely different. See Nomura’s entire Yamato toy lineup here. The second Banpresto product in this collection is the “Wave-Motion Gun Shooting” game from 2000. For the first time, fans could hold a laser-emitting Yamato pistol and take pot shots at an apoplectic super-deformed Dessler figure. Hitting a light sensor in his belt caused a spring to pop out of his feet and knock him over. Just like in the show! Time Warp is one of the many independent companies in Japan that arose from the garage kit boom of the 80s and 90s. Completely fan-driven, such companies make a wide variety of “wishlist” items like this Dessler costume kit, released in 1999. The head and clothing were scaled for a pre-existing 1/6 scale action figure named Kankichi Ryotsu from an anime police-comedy series called Kochikame. At right is the next largest Dessler figure in the lineup, a 1/6 scale statue. Standing just under 12″, it was manufactured by a company named Kaitendoh from a sculpt by Tohru Saegusa, who became well-known after his work for General Products in the early 80s. The statue was available exclusively through DeAgostini, publisher of the weekly Yamato Fact File magazine and came in two variants: full color and faux bronze. It was released in a limited edition to fill pre-orders in March, 2011. The most intense Dessler figure is this 1/6 statue from Megahouse (2001), which wins every staring contest and comes armed with an Ultra-Menace Missile. From two unknown independent manufacturers we have a pseudo-Greek bust and a double-figure pack with both Dessler and Captain Okita. Being forced to share a box, the two have gotten on each others’ nerves and are insulting each other on the label. Sold exclusively at the 2007 Winter Wonderfest, these soft vinyl figures from independent manufacturer Denboku put a comedic spin on Dessler and other Gamilons from Series 1. Paying heed to the infamous color shift in episode 11, Denboku was thoughtful enough to offer two versions of Dessler for the completists. First photo in this set courtesy Matt Alt. One way to keep a license affordable is to avoid sculpting specific characters and instead cast generic ones from pre-existing molds. That would explain the approach RZM took when it released this unnamed Gamilas officer in 2003 (along with a generic Yamato crewman). It was 1/6 scale (about 12″ tall) and had the added advantage of being available in multiple costume variants depending on your preference. Visit the RZM website here. Bandai’s online Lalabit Market released the classiest of all Gamilon products in 2008: a bottle of “Deslar Wine,” custom-packaged with its own stemware, two commemorative cards, and a high-quality reproduction of the Gamilas medal of honor. No report has yet surfaced about the wine itself, though it’s doubtful that any serious collector would dare to open it. The infamous wine glass remains the single most iconic Gamilon prop there is, and other manufacturers have taken their own crack at it. This all-glass version was a co-production by Aoshima and Skynet, released in 2009. 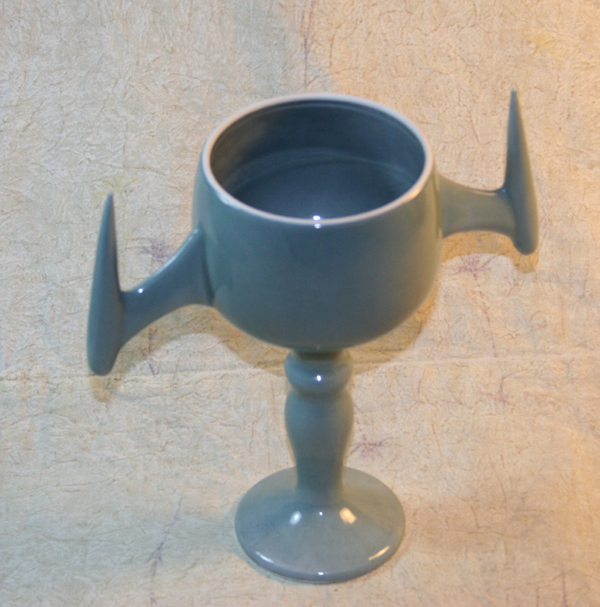 Fujimoto Kiln is the name of another independent company that made ceramic versions of the goblets seen in both Series 1 and Series 2. They look sturdy enough for any drink, hot or cold, and sharp enough to put an eye out…so drink carefully, Earthling. Here’s something you didn’t know you needed: a barren planet Earth (from Series 1) with a small lamp hanging over it. You can then buy a separate Gamilas Planet Bomb to put over the bulb and fill your room with the eerie glow of radioactive pollution. Cool, huh? One of the most endearing traits of toys made by dedicated fans is that they often treat obscure subjects with the same care and reverence as the popular ones. Such was the case with the Balanodon [Balanosaurus] from toy company Marmit (2007). It came with a tiny metal control ship and measured almost 18″ long. By no coincidence whatsoever, it was perfectly scaled to Bandai’s 1/350 Yamato model. You will no doubt be comforted by the knowledge that you share this planet with an actual full-scale Dessler throne that has made two public appearances so far. Its debut was as a prop at the 2007 rollout party for the first Yamato pachinko game, and it served that purpose again in at Yamato Expo ’10 with an added twist: a cape and a blue light positioned to turn you into the Gamilon you always wanted to be. Yamato Party member and friend-of-this-website Eisuke Ogura rose to the challenge, as shown above right. This entry was posted in Merchandising (1984-Now/Legacy Years), Merchandising (Series 1) by TimEldred. Bookmark the permalink.